Note: these snails are currently illegal to keep in the United States. The information on this page is also pre-2008, although more recent genetics testing on this and other species supports many of the older observations presented here. Although I did not start working with this species until 2004, it is the species I have devoted the most space to due to its enormous size and prolific tendencies. Pomacea insularum is a fascinating species that, unlike Pomacea bridgesii and other short-lived species, can live for 3-5 years, perhaps much longer in the wild. They grow slowly, but they also out-grow all other species currently in the pet trade reaching a whopping 4″ in shell size–big enough to do some damage to human hands if the handler is not careful with a hungry snail. My first experience with these snails was a shipment that I received and then split up amongst myself and two other people who had pitched in on the order. At the time, we thought we had hit it big time and found a source of Pomacea glauca, and were rather disappointed to begin with that the snails were in fact something from the canaliculata complex. However, the sheer size and strength of the snails was impressive. Most snails in the pet trade are small enough that they can’t hurt humans, should they choose to nibble on hands. However, one individual in that first shipment I received repeatedly crawled onto my unsuspecting hand in the murky tank while I was cleaning the filters and proceeded to leave bite marks on me. It was strong enough that when it got a good hold on the side of my hand it was not easy to pry off. Each time I gave it the benefit of the doubt, but it would always try to chew through my hands without fail. However, despite the fact that some individuals are distinctly not hand-friendly, these big snails are far more often bold and full of personality without showing carnivorous tendencies. Once used to hands, they will readily come out to walk on hands and can be hand-fed vegetables. Flat surface with an extra angle along the suture. Difficult to describe with words, but obvious when seen. The suture shape is not a smooth curve, but rather an acute angle in followed by a flat section running along the channel of the shell. Some individuals have such a deeply depressed suture and pronounced channel that they are almost Planorboid in shape. Reddening of the inner shell layer. This is most obvious for empty shells or unfriendly snails that have retracted far back into their shells, exposing the inner layer. early calcification of the operculum in juveniles. Adult male insularum snails are quite powerful. They are capable of crushing the shells of smaller, weaker-shelled species, and will attack each other over a breeding female. Male insularum will atack anothe mating male by biting at the head around and between the eyes, as well as biting at the foot. The females are oblivious to the fight going on attached to their shell, which is not surprising given that they can get even larger and stronger than the males. To start with: egg color can NOT be used to determine this snail’s species. The eggs range from atomic red to pale bubblegum pink. However, the eggs do not appear to come in canaliculata-orange. Eggs are laid in massive egg clutches, with egg counts as high as 1000 in a single clutch. The clutches are often the size and volume of lesser snail species. Depending on the temperature, the eggs can incubate as quickly as within 7 days. Normal incubation can be expected to run from 7-21 days. Hatchlings are escape artists. What they don’t climb out of, they do their best to chew through. Livebearer fish nets and other common tactics for raising young snails are useless for insularum: the nets are full of holes within a few days and those that didn’t chew their way out will have climbed over the size. For the first few months, Pomacea insularum can exceed the growth rate of all other domestic snail species I’ve worked with. When in the size-range of approximately dime-sized to 1″, the young snails are also extreemly aggressive. They have been observed to attack other snail species in groups, and the males often “play fight”–I use this term because it appears to be a more harmless version of what males later do in a violent way when competing over females. Bites are taken out of other snails feet, new shell growth, feelers, etc. After the first few months however, this phase ends and the growth slows. Suddenly the young snails become peaceful giants only interested in eating vegetables. It is at this time that the shell also calcifies heavily. 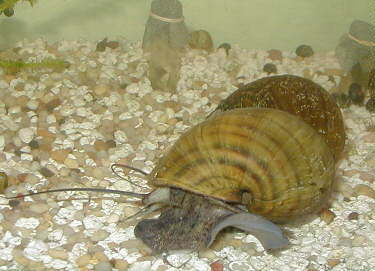 Juvinile and adult Pomacea insularum. Unfortunately, young Pomacea have yet to be raised to full size and sexual maturity while being documented. Since 2004, the oldest generation consists of largely sexually immature males. The offspring produced by captive breeding were at least 80% males in my tanks, which complicated the selection of breeding pairs for future study. 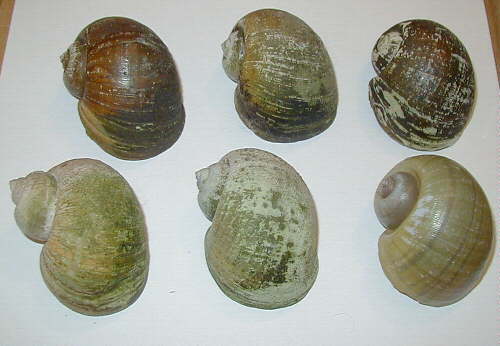 Pomacea insularum has an extreemly wide range of shell shape variation, as shown in these 6 shells. Of particular interest is the bottom left shell, which is from a canaliculata/insularum hybrid exhibiting a shell mutation. Unfortunately, the original classification of all snails in the canaliculata complex was a mess. Redundant taxonomic synonyms are rampant due to people discovering the same species at later dates, and few or no live animals were used to classify most of the species. 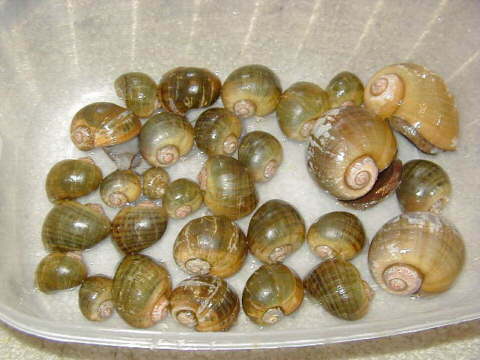 One of the biggest problem species for classification is Pomacea maculata–a species which has been alleged to be findable int he U.S. pet trade, but which I have not yet seen verifiably reported as found in pet stores or from breeders of snails matching the correct description. All descriptions for Pomacea maculata, except for egg color, match the living specimens of Pomacea insularum. 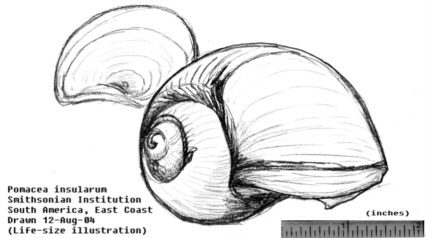 Recent research has suggested that the canaliculata complex should be collapsed to relatively few species (relevant abstracts described HERE on applesnail.net’s forums). 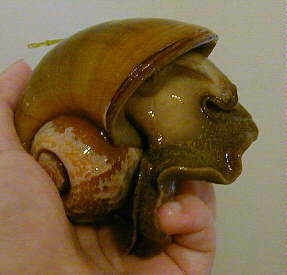 Pomacea insularum can apparently reproduce with Pomacea canaliculata, as observed on a small handful of crosses in captivity. However, the offspring are largely not viable and riddled with developmental problems, indicating that hybridization in the wild would be unlikely. A report came out early in 2005 stating that unusually large canaliculata snails up to 5″ in size had been seen in Florida over the last year. Coincidently, Pomacea insularum showed up in the pet trade not long ago from sources in Florida. The bottom middle green shell in the photo showing shell variation is from a Florida individual that had moss growing on its shell. The moss was unable to grow fully submerged, so that snail must have been out of the water quite a lot. The condition of the shell and moss suggest that it was a wild-caught individual that either escaped and was re-caught, or one that accidentally found its way into a fish farm and got shipped off to the pet store I purchased it at. Finally, in August, adult breeding insularum were confirmed in the Tampa area of Florida. Given their aggressive nature as juveniles, they have the potential to be a large destructive force on other native aquatic species.